A massive, moon-sized space station created by the AI as the final defense against the human onslaught. If the AI Home Command Station to which it is assigned is destroyed, the Avenger will live up to its name. The Avenger mounts an Avenger Shield Module, a Heavy Beam Cannon Module Mark IV, 3x Heavy Beam Cannon Module Mark III, and 8x Riot Control Shotgun Modules Mk II. This ship spawns to avenge the death of an AI Home Command station if the Avenger plot is enabled at game setup. When it spawns it has the combined stats of 6,000,000 health and 52,240 DPS. Beam Weapon Turret None 0.1 Command-Grade, 1.75 Heavy, 2.5 Medium, 3.5 Refractive, 4 Swarmer, 3.25 Ultra-Light. This is an AI only unit, and if you spawn it with the "Gimme Absolutely Positively Everything" cheat, it will have no shotguns, the Avenger Shield, only one MK III Heavy Beam, and the MK IV Heavy Beam. Avengers are one the MOST dangerous and powerful weapons in the AI's possession. They're armed to the teeth and they're extremely hard to kill. When an Avenger is destroyed, it explodes with the force of a Mk I Nuclear Warhead, destroying everything in the system it's in that is not immune to Nuclear Explosions, including all resources. Normally, Avengers only appear if the Avenger AI Plot is enabled and the AI's Home Command Stations die. If the AI decides to deploy an Avenger aagainst you, there WILL be suffering. However, Avengers can also appear in other circumstances. Enraging the AI to the point it goes berserk is the best way to encounter an Avenger (usually several at once). An example would be hacking the AI to the point the Hacking Points go very deeply into the negative, like -100,000. It can be easily done by hacking several Data Design Backups at once. The AI will become so angry it will throw over a hundred Avengers at you. Needless to say, the aftermath of an Avenger's assault (or several) should make it undesirable to piss off the AI to the point that it decides to start lobbing them at the player even if the Avenger plot is off. 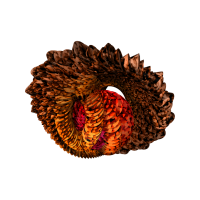 If you encounter one of these, they are not immune to the Spire Gravity Ripper's shots, which will greatly slow them down. Weapons that deal Artillery Damage like the Artillery Golem and the Orbital Mass Driver will also severely damage it. This page was last modified on 31 October 2018, at 00:09.